KATHMANDU, Nepal (CNN) -- Two people were killed and about a dozen others were injured when a bomb exploded in a Catholic church in Kathmandu on Saturday morning, police said. 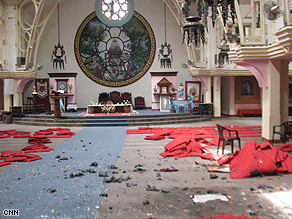 The damage inside the church in Kathmandu following Saturday's bomb blast. The explosion in the Nepalese capital killed a 15-year-old girl and a 30-year-old woman. "The bomb exploded inside the church when the explosion happened," senior police officer Kedar Man Singh Bhandari told CNN over the phone. About 100 people were in the church when the bomb exploded, police said. Manish Amatya, who was injured, said the blast interrupted their prayers. "There was a loud explosion while we were praying and all of us ran out screaming," he said. Investigations are under way to determine who planted the bomb, which damaged the church. CNN's Manesh Shrestha contributed to this report.